The updated Messenger look is rolling out again. Based on multiple reports, it seems the new design is being widely deployed to users. Thanks, Tyler Bendickson, Tomas, Ben Thomas! 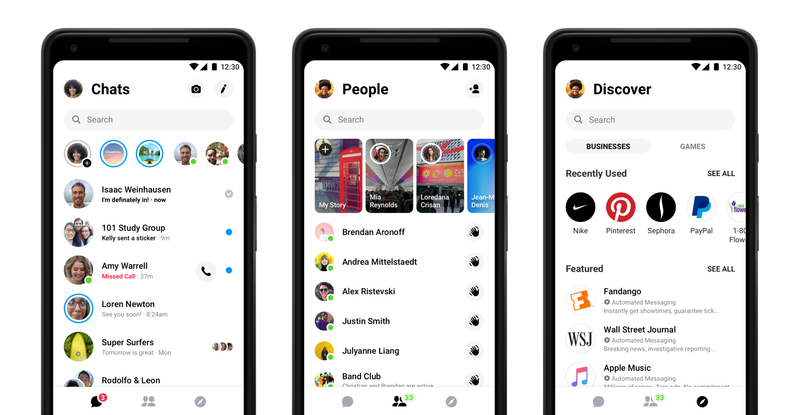 When Facebook announced the design overhaul for Messenger during its F8 developer conference in May, it promised to simplify the experience by removing unnecessary elements and putting emphasis on the most important features. The tech giant also assured users a dark mode was coming to its messaging platform. Now that the redesign has rolled out widely, it's time to evaluate whether Facebook delivered on those promises. The answer, it seems, is partially. The new UI is simplified in some respects. The app trimmed down the number of tabs from nine (approximately none of which I recall using) to three: one for chats, one for contacts, and one for games and chatbots. I will probably still only use one of those tabs, but it's a step in the right direction. Other than that, most of the other regular elements of Messenger have found their way over — though I was pleased to see Facebook has eschewed the largely useless 'Favorites Bar,' which interrupted the chronological flow of conversations with a band of people I might or might not want to converse with. Design-wise, Facebook is following the trends and going for an all-white aesthetic, which is a bit unfortunate as it doesn't seem to offer a night mode option just yet, from our testing — meaning you're stuck burning your eyes and running down your battery until the platform figures that out. The social media platform stated recently that users can expect it in the "near future" as part of a phased rollout. As for public reception, so far it's... not good. But, hey, it wouldn't be a Facebook design update without tons of disgruntled users, right? The design refresh, as mentioned above, is server-side, so you can't force an update, but if you don't have it right now it should pop up shortly. Messenger 4 seems to be reverting back to the old version for some users in the Android Police office. Many commenters and Twitter users are also seeing the change. It's possible that the new UI brought with it some unexpected bugs, or Facebook accidentally flipped the switch for more segments of users than it originally meant to and is back pedaling, but ultimately it's unclear what's behind the issue. Chances are it won't be too long before the update comes back for those who lost it, though.